Four TriMet operators were recognized today for their outstanding performance, with three selected as Operators of the Year. Operators qualify for the annual award based on outstanding driving records, customer service and attendance, with the winners selected by their peers. Another operator was inducted into the prestigious Million Mile Club for safe driving. 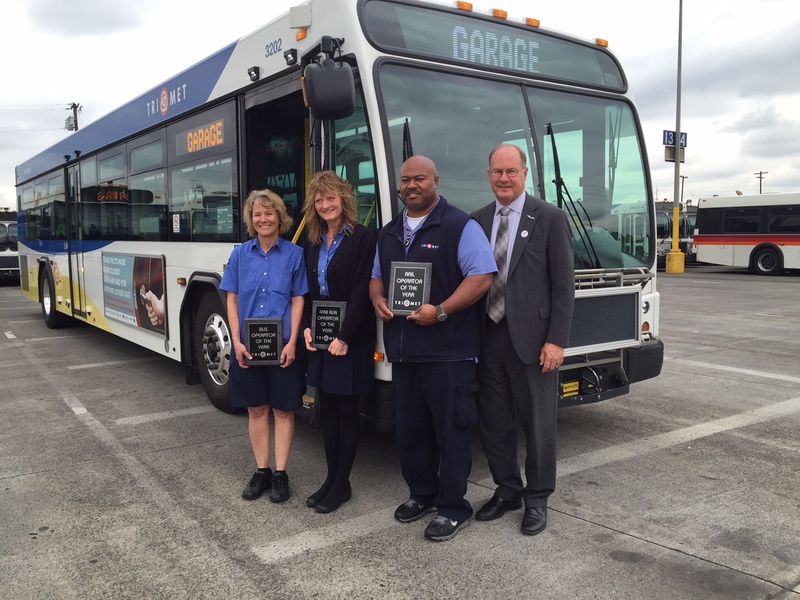 Lyn Simons was honored as TriMet’s Bus Operator of the Year, James Hilliard was chosen for light rail’s top award as MAX Operator of the Year, and Catherine McLendon was selected as the Mini-Run, or part-time, Bus Operator of the Year. During her 14 years of driving, Operator Lyn Simons has earned 12 National Safe Driving Awards and working on her 13th, seven Superior Performance Awards, and is a Senior Operator with a perfect record of zero preventable accidents. She has great customer service skills, which is not surprising as her peers describe her as “a hard worker, respectful and has a big heart.” Operator Simons lives in Milwaukie and currently drives Line 35-Macadam/Greeley and Line 96-Tualatin/I-5. James Hilliard was selected as MAX Operator of the Year. The SE Portland resident started driving a bus for TriMet in 2006, and switched to MAX in 2008. He is a high performer and has consistently qualified for operator recognition. He has a solid monthly perfect attendance record. 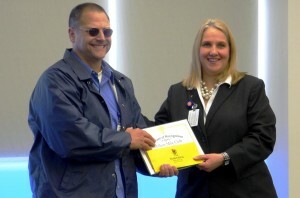 Hilliard is a Senior Operator and has nine Superior Performance Awards (SPA) and seven National Safe Driving Awards. Operators earn SPAs each time they go 1,960 hours of work without any preventable accidents, warnings, reprimands or suspensions. Over the years he has received recognition from bus dispatchers for helping out. His rail supervisor described him as “One of the most kindest, professional employees we could hope to have.” Riders can find Hilliard operating MAX morning trips on the Green and Yellow lines out of Ruby Junction Yard in Gresham. Beaverton resident Catherine McLendon has been driving for TriMet for 21 years and delivers a solid record for safety, customer service and attendance. As a part-time or “Mini-Run Operator,” McLendon has received 16 Safe Driving Awards, which means she’s driven 16 years without a preventable accident. She’s also received nine Superior Performance Awards, four Ace awards for helping honored citizen riders, is a Senior Operator, and has five years of perfect attendance. McLendon currently drives Line 45-Garden Home that runs between Southwest Portland and Tigard. Bus operator Robert Boos was inducted into the prestigious Million Mile Club for safe driving. Boos is a Milwaukie resident and has driven for 29 years for TriMet without a preventable accident. The distinguished Million Mile Club record has been achieved by more than 36 active and retired bus and MAX operators. It takes a minimum of 29 years of safe driving to reach the prestigious Million Mile Club ranks. Today’s annual ceremony also included recognizing 828 operators who have achieved an impressive safety milestone, earning a National Safety Council Safe Driving Award for having no preventable accidents for the year. This includes bus operator Ed Frey who earned his 44th annual National Safe Driving Award. Frey started driving in 1977. This year’s ceremony began with special tributes to the TriMet operators and staff, including Transit Police officers, who helped the Reynolds High School community following the deadly shooting on June 10, 2014. On that day, TriMet dispatchers and transportation staff quickly dispatched buses to the high school. The operators helped reunite students with their anxious families gathered at a parking lot nearly a mile and a half away. At today’s ceremony, Troutdale Police Lt. Joel Wendland presented TriMet with the Chief’s Award of Distinction. Reynolds’ Assistant Principal Mayra Gomez and students Isaiah Sims, Kayden Jones, Chris Underwood and Emir Kljucanin presented TriMet with a few commemorative challenge coins featuring the Reynolds Raiders logo that were made to honor the heroes who came to Reynolds aid that fateful day.